RoC® Smooth Perfexion® Instant Line Corrector with COPPER-ZINC TECHNOLOGY is a new lightweight product that bridges the gap between skincare and cosmetics to deliver beautifully smooth and visibly firm skin in one easy step. The product has a very unique consistency and appearance. The product itself is super silky serum-like gel-like product. It has a grey cast (from the active combination of Copper and Zinc: this grey cast disappears as you smooth the product onto your skin). It feels smooth and silky to the touch. As you apply it to your skin, it literally smooths in/fills in your fine lines and wrinkles. It feels silky smooth on your skin while also feeling like nothing at all! It almost disappears into your skin just leaving it feeling softer and smoother while blurring the look of fine lines and pores. The primer-like qualities provide an ultra-smooth surface for makeup application. In the past, I will fully admit that using a primer is a step I often skip. As a busy stay-at-home Mommy of a 1 year old and 3 year old...who has the time for an extra step? Well, I find that with this product, I want to add in the extra step because this product is so much more than just a primer. It is also an anti-aging treatment serum! Copper and Zinc have anti-aging abilities to not only smooth your fine lines and wrinkles but also to increase skin firmness. Plus, this product is a nice complement to any retinol skincare routine as Copper and Zinc work well in conjunction with Retinol. As far as results, the biggest that I see is the instant smoothing effect of this product. When applying makeup, my pores and fine lines are less apparent. I also feel that my skin looks and feels more hydrated and plump when I use this. Only time will tell when assessing the anti-aging and firming product claims. However, so far, so good! I am really enjoying using this product! 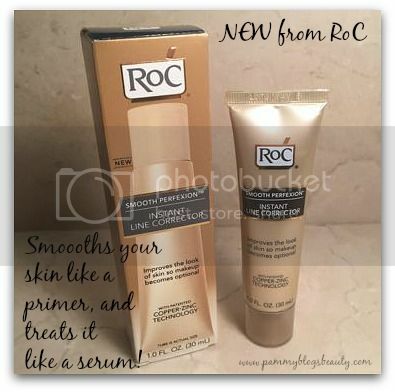 Next time you are in the drugstore, be sure to check out this new RoC® Smooth Perfexion® Instant Line Corrector with COPPER-ZINC TECHNOLOGY. I recommend replacing your usual primer with it for a few weeks. You are not going to want to go back to a regular primer after using this one packed with anti-aging ingredients!